The American Heart Association (AHA) has updated the 2008 exercise guidelines for all ages. The 2nd Ed. is plump full of info but most importantly it emphasizes ‘just move’. 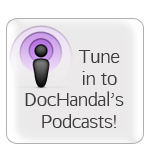 Listen Up to Doc Handal’s new podcast. Feel God or even the Galaxy will probably provide it and let go THE HOW or when it will arrive.